Building the FLTK library is pretty easy. and select Advanced tab. 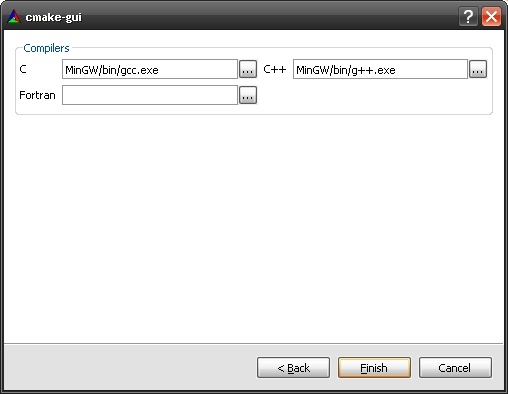 Press the "Environment Variables" and add the MinGW folder path into the PATH variable. In some cases MinGW setup lets you add this automatically. Lets setup the CMake. 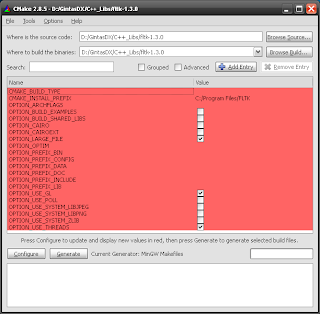 Run the CMake-GUI application and setup the extracted FTLK library folder. I was testing this with stable 1.3 and 1.1.10 versions. 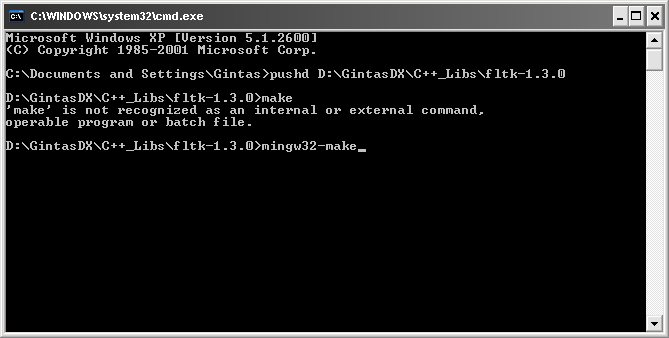 "MinGW Makefiles" and select "Specify native compilers". 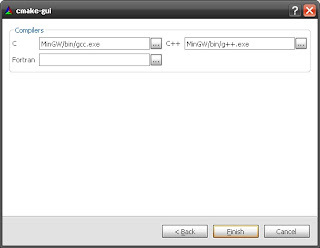 Browse for the C and C++ compilers in MinGW folder. Your settings should look like this. We don't want to use the system libraries and build all the examples. 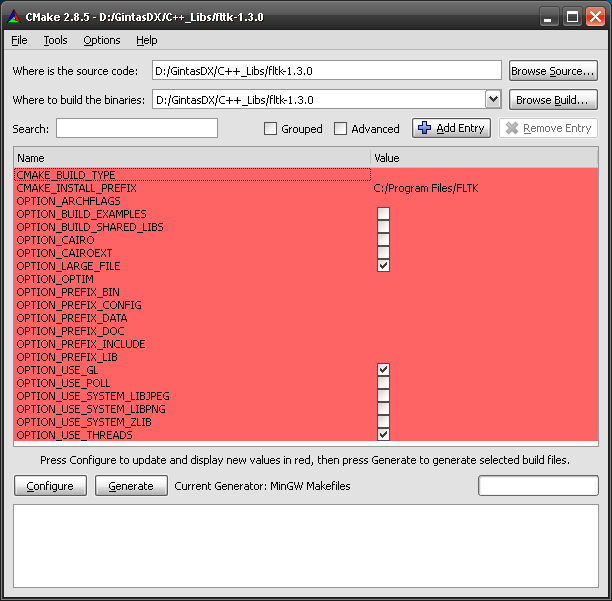 Hit the Configure button and later Generate. All the red warning should be gone. Now we have configured and build all makefiles we need. Lets build the library and FLUID. "Run..." and type cmd in opened window. Now you need to execute command pushd . 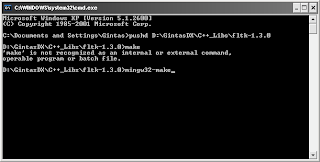 And execute command mingw32-make or just make. Look the image bellow. FTLK bin folder. Or in the folder defined in CMake. Copy those libraries into MinGW installation lib folder. 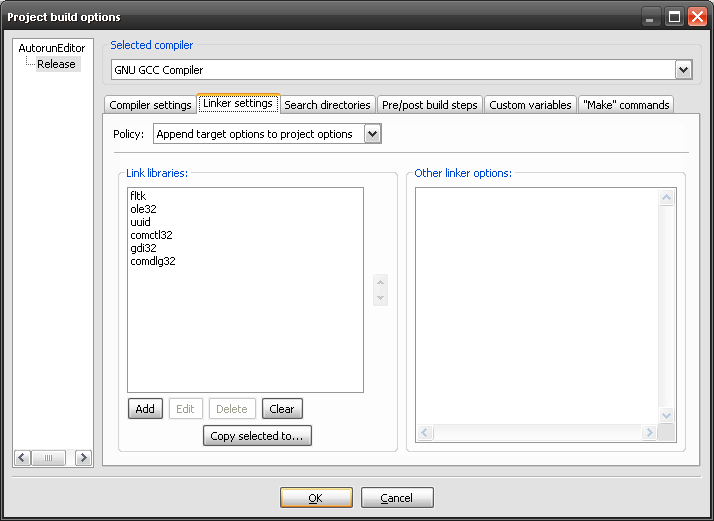 Settings->Compiler and debugger... -> Global compiler settings -> Search directories tab. How to build libraries on Linux? Everything is quite the same. 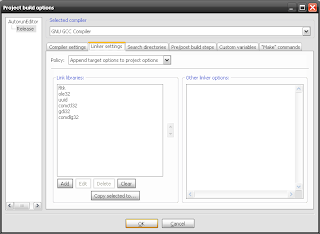 You need to download cmake and cmake-gui (probably with QT interface). After generating makefiles right click on the FTLK source folder and open the terminal. for that function to see what library you will need to link. If you are building a new project using wizard simply make new folder called include in FLTK library folder and copy here the FL folder since Code::Blocks Project wizard always looks for include folder. You can download my Win32 build version with 4 extra Gleam themes. Thank you! This was immensely helpful and simple. Thank you again! You are welcome! It was really confusing at first for me too. Well that was a complete waste of time. CMake Error: The source directory "" does not exist. It hasn't been updated for a years and maybe whole compilation process is changed. I am no longer into C++. I bet it's still easy to compile FLTK lib.